I’m always excited when I find a place that easily combines the wine and travel theme, so when I found one that was just a few hours away, I couldn’t wait to check it out. Lynfred Winery turned out to live up to this spirits traveler’s expectation – both in the wine and the accommodation. A few years ago, I had the pleasure of spending a week at the Rome Cavalieri Hilton. It’s hard to describe the opulence of that hotel, with a touch to every detail that made you feel like you were in a Roman palace. I’ve stayed in some great places since then, but nothing quite like that – until I stepped into the Italian Suite at Lynfred Winery. The suite is one of four. Each is unique and named after a wine region of the world. 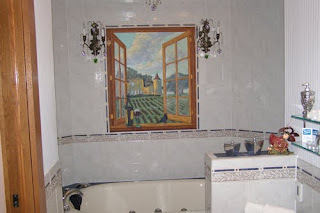 And each seems to remember every luxury, from heated floors to marble bathrooms (with perfect Jacuzzi tubs). The fireplace and cozy living room just begs for a bottle of wine – and you don’t have to go far to get it. Just below the incredible suites is the actually winery and tasting room at Lynfred. The house was bought in 1977 by Fred and Lynn Koehler (“Lynfred”). They opened the winery in 1979, added a second building in the 1990s so they could continue to live there, and opened the Bed & Breakfast in 2002. The wines here (there are over 50) come from grapes in the best wine regions of the world. They are masterly chosen and blended by Andres Basso. The native of Chile has previously brought award-winning wines from Napa to Virginia and he loves to experiment with organic wines. 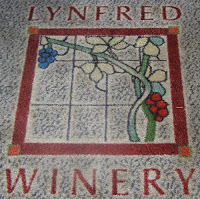 The Pacific Northwest is a frequent location of many Lynfred grapes these days. Basso keeps in touch with vintners around the world looking for just the right blend and flies wherever necessary to taste, before returning to his lab to create the next award-winner. Though there are too many to mention, I found their 2008 Sauvignon Blanc, which won Gold at last year’s World Value Wine Challenge, to be a perfect blend of dry and sweet. Definitely worth a try is the Rose. It is much drier than most, but light enough to enjoy at a barbecue. The Lynfred Rose has won five medals, including Gold at the Indiana International and Silver at the Tasters Guild International. 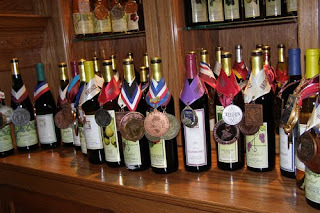 They also have a 2005 Merlot that was a Double Gold winner at the San Francisco Chronicle event. Like many Midwest wineries, you will find fruit wine at Lynfred, but it is a bit different here. There are many different fruit wines – made 100% from the fruit on the label. Some of the flavors are seasonal, like the Cranberry for the holidays (which I had at my dinner table)... Pomegranate and apricot have become very popular ones. If you aren’t quite ready for fruit wine, I would suggest the Ice Wine, as good as I’ve had at a much lower price ($35). At Lynfred Winery it is as much about the experience as it is the wine. 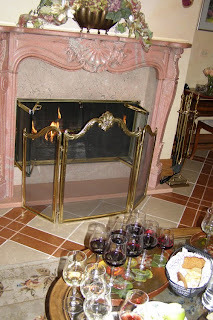 If you stay in the Bed & Breakfast, you will be welcomed with a private tasting in front of the fire (or you may choose to have it another time during your stay). There’s also an array of choices for breakfast which you can pre-arrange to your exact specifications and can even be served in your room. During your stay you can take private tours, relax in your suite, or even arrange for a massage. Lisa is your host to arrange for your needs. For those not staying overnight, Lynfred is open every day for Chicagoland locals and out-of-town visitors. There is an assortment of options for tastings with cheese, dessert, hors d'oeuvres, or some of their special homemade bread and pies. Be sure to check their website frequently for events and special tastings, as well as information on becoming a member so you can be the first to taste new and special selections. For reservations or additional information, call Lynfred Winery at (888) 298-Wine. Note: There is a second Lynfred Winery location in Wheeling, Illinois. I am looking forward to checking that one out when the weather improves.